For almost four years now, this site has supplied the interested visitor with information about “Kommando Welter” or – as it was later designated – 10./NJG 11. The unit was the first and only unit that flew nocturnal combat missions (aka: “Nachtjagd”) using the Messerschmitt Me 262 A and Me 262 B-1a/U1. What has started as a “curiosity project” has turned into a five year long research trip which has now been documented in an almost 600-page strong book. 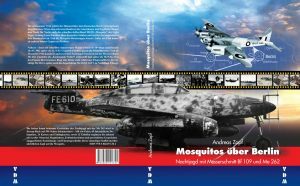 The book is written in German but the publisher and me are open for interested English-language publishers since a good portion of the work covers the operations of the Mosquito-Squadrons of the Light Night Striking Force. “Late in the summer of 1944, the skies over the Reich were mostly dominated by the Allied air forces. The heavy bombers of the USAAF at day, the ones of the RAF at night. In addition more and more the fast deHavilland DH.98 ‘Mosquito’ of the Light Night Striking Force which can – with little to no opposition – road the skies over the German Cities more or less unchallenged. Besides the ever present Flak, there is not much they have to fear. ‘Not much’, however, is relative. With their fast and agile Messerschmitt Bf 109, some specialized units such as the 10./JG 300 and later II./NJG 11 are operating especially against the fast ‘Wooden Wonder’. And starting December 1944, first nocturnal missions using the Me 262 are added to the threat. Starting out as ‘Kommando Welter’ and being taken into regular operations as 10./NJG 11 later, a handful of skilled pilots are flying the single-seated Me 262 A and later the Me 262 B-1a/U1 twin-seater to counter the nightly Mosquito attacks. As a courtesy, any links from other websites that have been referring to the individual articles on this site have automatically been redirected here to ensure that the owners of these sites are not “hit” by broken hyperlinks. Please visit www.nachtjagd-me262.org for more information about content, availability, and sources for “Mosquitos über Berlin – Nachtjagd mit der Messerschmitt Bf 109 und Me 262”.